Government officials yesterday marked National Disability Day and encouraged disabled youths to be globally competitive. There are 60,610 students living with disabilities, the officials said, adding that a total of 1,252 disabled people are working in the education sector without facing discrimination. In addition, a total of 1,433 blind and deaf students are enrolled in special education schools. 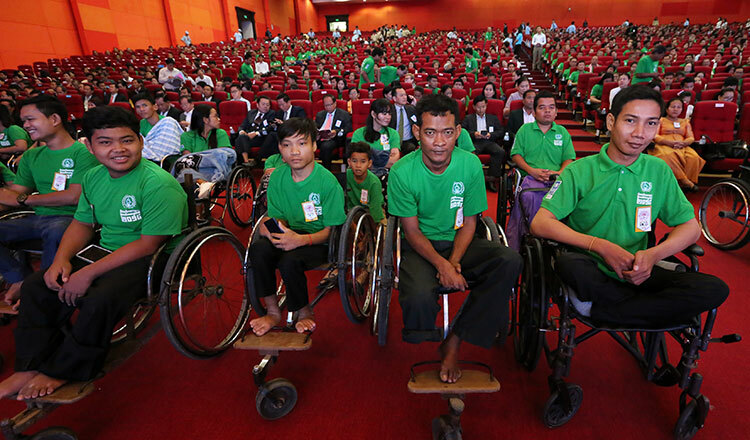 “Youths living with disabilities are encouraged to participate in global disabled youth competitions in the region and in the world in order to bring home medals and national prestige,” said Deputy Prime Minister Bin Chhin. Mr Chinn said there are about 8,200 schools across the country designed to accommodate and educate disabled students so that they do not get left behind in society. He noted that the marking of National Disability Day yesterday served as a reminder of the destruction left behind by war. He added that the government has distributed land titles to disabled veterans in several “disabled development zones” in the provinces of Kampot, Banteay Meanchey and Siem Reap complete with rehabilitation services, housing and commercial farms. Social Affairs Minister Vong Soth yesterday said the public sector has employed 2,839 disabled persons this year alone. Mr Soth said 1,478 of them have been employed in ministries and state institutions, while 77 companies in the private sector have employed 3,055 people. Sam Bun Long, a 28-year-old living with disability, yesterday said people like him are encouraged by the government to find employment in public and private sectors. “What’s important is that people living with disabilities have developed abilities so that they are encouraged to study and work and have a chance like other people,” Mr Bun Long said. On Monday, Prime Minister Hun Sen said public and private sectors should continue to encourage those living with disabilities to work in order to be qualified to be employed. Mr Hun Sen added that disabled people are not to be discriminated against.